The Art of Relaxation is a 2-hour experience of deep relaxation, safety and restoration. A reprieve from busy-ness, this class is an invitation to settle down, open up, and rest in the heart. 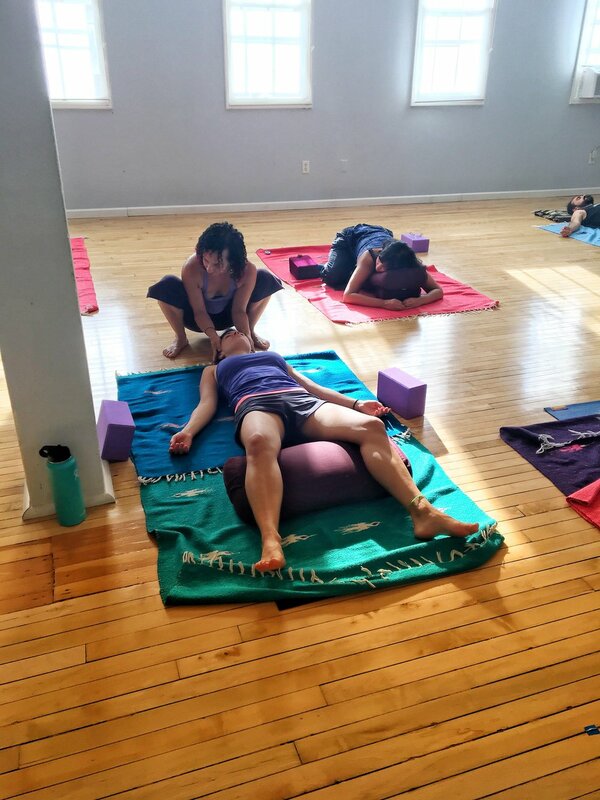 While Ilana guides you on a journey of delicious movement and deep stillness, skilled massage therapists, with training in a wide array of healing modalities, circulate the space offering massage, healing touch and grounding support. It is a powerful experience of community and combined intention, while cultivating the possibilities of your own loving attention towards yourself. Regular self care and therapeutic touch are an invaluable resource for regulating stress, reducing chronic pain and simply slowing down and reflecting. If a monthly massage session is outside of your budget, The Art of Relaxation can be a more affordable way of receiving the benefits of massage while also supporting our amazing local community of healers. Workshops will continue to be announced throughout the year! Fine Spirit Studio is spacious and quiet, located in the Fall Creek area of downtown Ithaca. Your space in class is confirmed once you’ve submitted your payment. **Please note that credit card payments include a 3% surcharge.